Pete Seeger, the legendary (88 year old!) folk singer, will be giving a free concert in Paramus New Jersey at the library band shell at 6:00 on Tuesday, Aug 26. This is a unique opportunity!!! I can't remember the last time there was a chance to hear and see him in the New York area! Still playing in New York is the daring film, THE LAST MISTRESS: The dream pairing of daredevil screen siren Argento with Breillat, France’s foremost provocatrice, THE LAST MISTRESS is a smoldering adaptation of Jules Barbey d’Aurevilly’s scandalous 19th-century novel. Set during the reign of “citizen king” Louis Philippe, it chronicles the surprising betrothal of former libertine Ryno de Marigny (newcomer Fu-ad Aît Aattou) to Hermangarde (Roxane Mesquida of FAT GIRL), a virginal daughter of French aristocracy. Lurking in the margins – and in the imaginations of high society’s gossip-hounds – is de Marigny’s jealous lover of ten years, Vellini (Argento). Described as, “a capricious flamenca who can outstare the sun,” Vellini still burns for de Marigny, and she will not go quietly. Though a fascinating departure into more traditional storytelling, THE LAST MISTRESS sees Breillat continuing her career-long interest in the ramifications of female desire, casting Argento as an impassioned independent woman for the ages. Her performance – full-bodied, emotionally daring, volcanically carnal – is simply something to behold. Cinemart Cinemas 106-03 Metropolitan Avenue (Metropolitan Avenue & 72nd Road), Flushing, NY 11375 The Quad Cinema 34 West 13th Street New York, NY 10011; and possibly other theaters! Every time you upload a video, you first check on some box that purports to say you have complied with and agree to the terms of the upload on the site. The terms of the site may not be to your liking. By uploading and checking the box, you may (or may not) be giving away your video, or accepting liability for something that happens in the future, or accepting other terms or conditions you might not like. Below is an excerpt from a typical agreement associated with a contest. The names of the sponsors of the contest and the name of the site have been omitted. This agreement (like many others I've seen) seems to be poorly written; in this case, contradicting itself, first saying you give up all rights in the video just by uploading it, then saying you are providing non-exclusive rights. In neither case is there any compensation for giving up rights unless you win the contest. This agreement (in other places) does not seem to ask you to assume liability, but it does ask you to waive potential avenues to seek redress for some things from the sponsor. Typically, the most important issues are rights, compensation and liabilities; but there may be other parts of an upload agreement (or contest rules) that you need to check also. S0, read it carefully, and check the agreement with your lawyer before you accept an upload agreement. Make sure that the value of the particular upload is worth accepting the terms at that particular site! > notification, to you or any third party. Photo Credit: Tony Rivetti Jr. The 46th New York Film Festival will run from Sept. 26 to Oct. 12. Due to ongoing renovations at the festival’s traditional home, Alice Tully Hall, this year’s festival screenings will be held at New York’s historic Ziegfeld Theatre. Additionally, two showcases at the Film Society’s Walter Reade Theater will round out the festival’s main line-up with historical and alternative perspectives. The Class, (Entre les murs), Laurent Cantet’s Cannes Palme d’Or winner, will open the Festival; it is the North American premiere. Opening Night director Laurent Cantet is no stranger to New York audiences, as three of his four features have been included in Film Society programs: Human Resources (Ressources humaines, New Directors/New Films 2000), Time Out (L’Emploi du temps, New York Film Festival, 2001), and Heading South (Vers le sud, Rendez-vous with French Cinema 2006). “Laurent Cantet has pioneered a new kind of social cinema,” says selection committee chair Richard Peña, “one that explores the key issues of our day, from contemporary labor struggles to First World/Third World relations and now to education, with a startling boldness and freshness in approach. The Class is the finest example yet of this filmmaker's important work." Photo taken by Georgi Lazarevski. The film follows François Bégaudeau and his fellow teachers as they prepare for a new year at a high school in a tough neighborhood, where the students’ difficult behavior often jeopardizes their teacher’s enthusiasm for the low-paying job. Armed with the best intentions, they brace themselves against discouragement and anxiety to provide the best possible education to their students. Cantet presents the classroom as a microcosm of contemporary France—a place where cultures and attitudes often clash, in which François’ distinctive honesty and frankness is quickly put to the test. The Class will be released in North America by Sony Pictures Classics. In the Realm of Oshima runs throughout the festival to celebrate the work and pivotal influence of Japanese filmmaker Nagisa Oshima. In the Realm of Oshima, the official festival sidebar, follows director Nagisa Oshima’s career journey from the groundbreaking Shochiku Studio—where he created Cruel Story of Youth, launching the Japanese New Wave—to his experiments in a range of styles in visionary productions including Boy, The Ceremony, In the Realm of the Senses, Merry Christmas, Mr. Lawrence (starring David Bowie), Night and Fog in Japan, Pleasures of the Flesh, The Man who Left His Will on Film, and Violence at Noon, among many others. The most pervasive subjects in Oshima’s films tackle the government’s betrayal of the promise of postwar Japan and the continuance of repressive traditions under the cloak of modernity, making him a relevant and powerful voice in the United States this election year. The tribute, co-organized by the Film Society of Lincoln Center and the Cinematheque Ontario and curated by James Quandt, presents to a new generation of moviegoers one of world cinema’s most accomplished and prolific artists. The annual Views from the Avant-Garde, presented during the festival’s second weekend, will feature a 30th anniversary presentation of Guy Debord’s In girum imus nocte et consumimur igni. Views from the Avant-Garde will again offer New Yorkers a fresh harvest of the best new experimental films from some of the world’s most adventurous artistic talents. This year, it honors the essential thinker and filmmaker Guy Debord with a subtitled screening of In girum imus nocte et consumimur igni. A legendary leftist political philosopher and revolutionary theorist, Debord’s ideas helped lay the ideological groundwork for both the May ’68 generation and the Situationism movement, which critiqued capitalism, consumer culture and moving-image media. Following Debord’s suicide in 1993, many of his films remain unavailable or untranslated. This screening of In girum imus nocte et consumimur igni, whose title is an enigmatic Latin palindrome that translates as “At night we walk in circles and are consumed by fire,” offers a rare glimpse at a landmark film that capitalizes on the aesthetic tactics of Situationism, including the use of appropriated images to critique image culture itself. It reuses footage from Les Enfants du Paradis, The Charge of the Light Brigade and films about Robin Hood, Zorro and General Custer, among many sources. The 2008 edition of the New York Film Festival, the Film Society’s 17-day look at the state of American and international cinema, is programmed by five critics and curators who have returned to the festival’s selection committee from last year. Richard Peña, committee chair and program director at the Film Society; Kent Jones, associate director of programming at the Film Society; Scott Foundas, film editor and chief film critic for L.A. Weekly; J. Hoberman, senior film critic at The Village Voice; and Lisa Schwarzbaum, film critic at Entertainment Weekly will join forces to hand-pick approximately 25 features and several shorts to make up the 2008 slate. Presented by the Film Society, the annual New York Film Festival showcases new works by both emerging talents and internationally recognized artists, including numerous New York, U.S., and world premieres. All filmmakers, regardless of experience, are invited to submit work. The Ziegfeld Theatre is located at 141 West 54th St. The Film Society’s Walter Reade Theater is at 165 West 65th St. close to Amsterdam Ave. More information is available at http://www.filmlinc.com/. The North American premiere of Clint Eastwood’s “Changeling” will be featured as the Centerpiece of the 46th New York Film Festival and Darren Aronofsky’s “The Wrestler” will be the festival’s Closing Night selection. A newly restored print of Max Ophuls’s final masterwork “Lola Montès” will be featured as the festival’s spotlight retrospective. All three films headline the festival’s 28-film main slate. Clint Eastwood’s provocative period drama “Changeling” stars Angelina Jolie as Christine Collins, a single mother in 1928 Los Angeles who returns home to find her nine-year-old son missing. The police return five months later with a child claiming to be her son, but despite the affirmation of the media, she remains unconvinced. After she unites with community activist Gustav Briegleb (John Malkovich), Collins’s desperate search for her child becomes an unlikely campaign against institutional corruption and a vigilant stand for equality under the law. The film was written by J. Michael Straczynski and produced by Eastwood, Brian Grazer, Ron Howard and Robert Lorenz, with Tim Moore and Jim Whitaker as executive producers. It screened at the Cannes Film Festival and will be released by Universal. In the title role of Darren Aronofsky’s Closing Night film “The Wrestler,” actor Mickey Rourke gives “a performance of a lifetime,” says the Film Society’s Kent Jones. He plays once-popular pro Randy “The Ram” Robinson, who now ekes out a living performing for diehard wrestling fans in small-town venues throughout New Jersey. A heart attack forces him to reconsider his life, but his attempts to reconnect with his daughter (Evan Rachel Wood) and start a relationship with stripper Pam (Marisa Tomei) cannot outshine the allure of the ring. The film was written by Robert D. Siegel and produced by Scott Franklin and executive producer Jennifer Rother. “Changeling” and “The Wrestler” follow on the notable success of last year’s Centerpiece and Closing Night selections: the Academy Award-winning “No Country for Old Men” and Oscar-nominated “Persepolis,” respectively. France is represented in the festival’s main slate through four French films and eight international co-productions. Alongside the Opening Night film—Laurent Cantet’s “The Class”—French entries include Arnaud Desplechin’s star-studded family drama “A Christmas Tale,” Agnès Jaoui’s story of aspiring filmmakers following a rising female politician “Let It Rain” and Olivier Assayas’s moving introspection on time and mortality “Summer Hours.” Israeli director Ari Folman’s animated wartime autobiography “Waltz with Bashir” is one of several prominent French co-productions. The United States is the slate’s second most represented country, with “Changeling,” “The Wrestler,” Antonio Campos’s “Afterschool,” Kelly Reichardt’s “Wendy and Lucy,” and Alexander Olch’s “The Windmill Movie” all featured in the festival. The Film Society welcomes a group of well-established alumni back to the New York Film Festival with new features, including Jia Zhangke (“24 City”), Wong Kar Wai (“Ashes of Time Redux”), and Mike Leigh (“Happy-Go-Lucky”). Steven Soderbergh also returns to the festival with “Che,” a controversial, two-part biography whose star, Benicio del Toro, won the Best Actor award at this year’s Cannes Film Festival. Other prominent Cannes prizewinners in the slate include Matteo Garrone’s “Gomorrah” (Grand Prize), Steve McQueen’s “Hunger” (Camera d’Or), Sergey Dvortsevoy’s “Tulpan” (Un Certain Regard Prize) and Kiyoshi Kurosawa’s “Tokyo Sonata” (Jury Prize, Un Certain Regard). Additionally, Max Ophuls’s final masterpiece “Lola Montès” will be screened at the New York Film Festival for the third time, now as the spotlight retrospective. A biography told in flashbacks of notorious dancer and courtesan Elizabeth Rosanna Gilbert—aka Lola Montès—Ophuls’s film is a meditation on time and the evanescent nature of fame and riches. Several earlier attempts to restore prints of “Lola Montès” have encountered difficulties due to Ophuls’s use of the relatively unstable Eastmancolor process. The 46th New York Film Festival will screen a gleaming new restoration from the Cinémathèque Française, which incorporates all available footage. Tickets for the festival will go on sale Sunday, Sept. 7, at 12:00 noon at Avery Fisher Hall, corner of Columbus Avenue and 65th St.; Monday, Sept. 8, online at http://www.filmlinc.com/; and on Saturday, September 27 at the Ziegfeld Theater, 141 West 54th St.
For all other details and further information, please visit http://www.filmlinc.com/. The 46th New York Film Festival is sponsored by Chopard, The New York Times and Sardinia Region Tourism. An additional Opening Night screening, as well as Closing Night, will be held at Lincoln Center’s Avery Fisher Hall, corner of Columbus Avenue and 65th St. Other screenings and events will take place at the Film Society’s Walter Reade Theater, 165 West 65th St. close to Amsterdam Ave. More information is available at http://www.filmlinc.com/. A tough, lively and altogether revelatory look inside a high school classroom, enacted by real teachers and students. Angelina Jolie is a single mother whose troubles are just beginning when her son goes missing in Clint Eastwood’s majestic fact-based period drama. Mickey Rourke gives the performance of a lifetime in Darren Aronofsky’s raw and raucous new movie. The rise and fall of a Chinese factory town is chronicled in this film, straddling the border between fiction and documentary. When two students at a posh prep school accidentally overdose, a student filmmaker struggles to create an appropriate tribute for them. The final, definitive version of Wong Kar Wai’s modernist take on the classic Chinese martial arts tale. A powerful, engrossing meditation on politics and the contemporary cult of surveillance. Steven Soderbergh’s two-part Spanish-language epic about Che Guevara’s revolutionary military campaigns in Cuba and Bolivia features a brilliant lead performance by Benicio del Toro. A Kazakh, minimalist adaptation of Anna Karenina. Arnaud Desplechin’s grand banquet of a movie brims with life, as Catherine Deneuve, Mathieu Amalric, Emmanuelle Devos and the other members of a marvelous ensemble cast come home for Christmas. This visually mesmerizing tale of a shy man and his obsession with the woman across the way marks the triumphant return of Polish maestro Jerzy Skolimowski. A blistering version of Roberto Saviano’s modern true crime classic about the modern-day Neapolitan mafia. An affectionate portrait of an unattached, 30-something London schoolteacher coming to terms with the fact that she’s no longer young. Argentine filmmaker Lucrecia Martel’s powerful third feature takes us into an altered perceptual state with a woman who hits something with her car. British visual artist Steve McQueen’s feature film debut is an uncompromising look at the hunger strike led by IRA prisoner Bobby Sands in 1974. Two Mexican teenagers go into hiding to see the reactions their disappearance will get from relatives and friends. A portrait of a rising feminist politician may be the ticket to fame and jobs for two aspiring filmmakers. The life of the legendary courtesan and circus performer—lover of kings, knaves and Franz Liszt—is presented in its definitive, restored version. When his life in Seoul becomes too complicated, an artist hightails it to Paris—but things don’t get any easier. A woman searches for the truth about her life in the stories of ancestors and the distant manor house they inhabited. Juliette Binoche is one of three siblings brought face-to-face with time and mortality by the sudden death of her mother in this moving new film from Olivier Assayas. A Japanese family struggles to re-define itself after the father loses his corporate job. In the dark days of the Pinochet dictatorship, a John Travolta wannabe blazes a murderous trail through the back alleys of Chile. Winner of the Un Certain Regard Prize at this year’s Cannes Film Festival, Tulpan charts an aspiring herdsman’s efforts to win the attention of his intended. Israeli filmmaker Ari Folman’s haunting autobiographical memory piece about his experiences as a soldier during the 1982 war in Lebanon are given a hyper-real spin by state-of-the-art animation. In Kelly Reichardt’s follow-up to her acclaimed Old Joy, Wendy (Michelle Williams) searches for her dog Lucy. The troubled spirit of modern America is beautifully evoked along the way. Filmmaker Alexander Olch, using material left by the late filmmaker Richard Rogers for a never completed film autobiography, attempts to make sense of the life of his former teacher and friend. Watching Anita O'Day: The Life of a Jazz Singer, the more I watched, the more I wanted it to continue ... watching forever her performances. Though somewhat less well known to the general public than other great jazz singers such as Ella Fitzgerald, and Billie Holiday, she is generally taken by jazz lovers to be one of the five or so greatest jazz singers ever. She was especially noted for her rhythmic and improvisational skills. 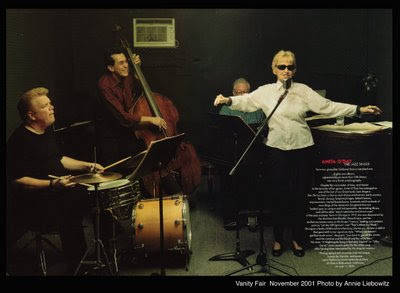 She was one of the rare white female jazz singers. And one whose performances with white and "colored" musicians in a time of great prejudice were essentially color-blind. This film, in addition to generous clips of her performances, including her famous appearance at the Newport Jazz Festival in 1958, features numerous luminaries talking about her, and excerpts from interviews with her late in her life. She made up her stage name, O'Day, from the pig-latin (or atin'lay ig'pay) for dough (slang for "money" in those days). What most characterized her singing (and off-stage) personality was a compelling mixture of hot and cool, diffidence and commitment. She sang cool jazz with rhythmic heat. She affected not caring about problems, taking them as they come, yet had a steely determination. For part of the film -- if you stopped somewhere in the middle -- listening to her you would think she was a spokeswoman for the drug lobby, giving a most matter of fact description of why drugs are good to use; making an almost convincing case for using them. Later, after describing how a friend died of an overdose, and she, herself, almost did as well, she describes her own heroic, one-woman detox program, going to Hawaii by herself to clean up. It was her personality, integrated into her musical performances that made her -- and this film -- special! 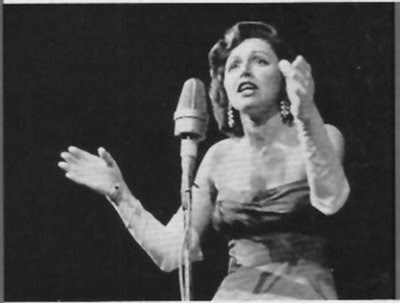 Anita, and her performances, are in several films. 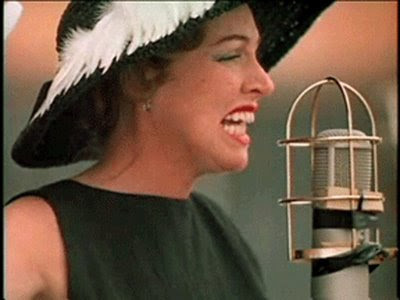 Anita O'Day: The Life of a Jazz Singer is well worth seeing... and listening to, too!